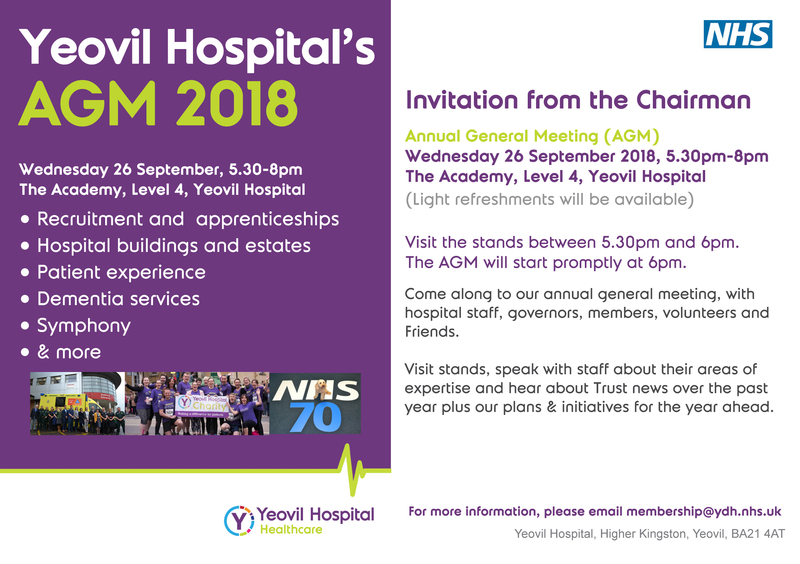 Yeovil Hospital invites patients, staff and local residents to come along to its AGM to find out more about their local hospital. Our AGM event aims to reflect the passion and interest in local services among our patients and patients’ families, members and governors, staff and management, volunteers and other members of the local community. From 6pm in the Academy’s Marsh Jackson room you can hear about how we managed with the severe weather from last winter and more about our subsidiary companies: Daycase UK, Simply Serve Limited and Symphony Healthcare Services. Find out more about these companies and how they sit within the Yeovil Hospital team. Following this, there will be the formal AGM where Jonathan Higman, CEO, will give you an overview of the previous year including our finances and will discuss our plans for the year ahead. Drop in at any time between 5:30pm and 8pm. Stay as long as you want, have a cup of tea or coffee and find out about everything happening at Yeovil Hospital.